The first planks are on it. I go a little bit different as what the manual is saying. Normally you have to do the planking till the hull is closed. 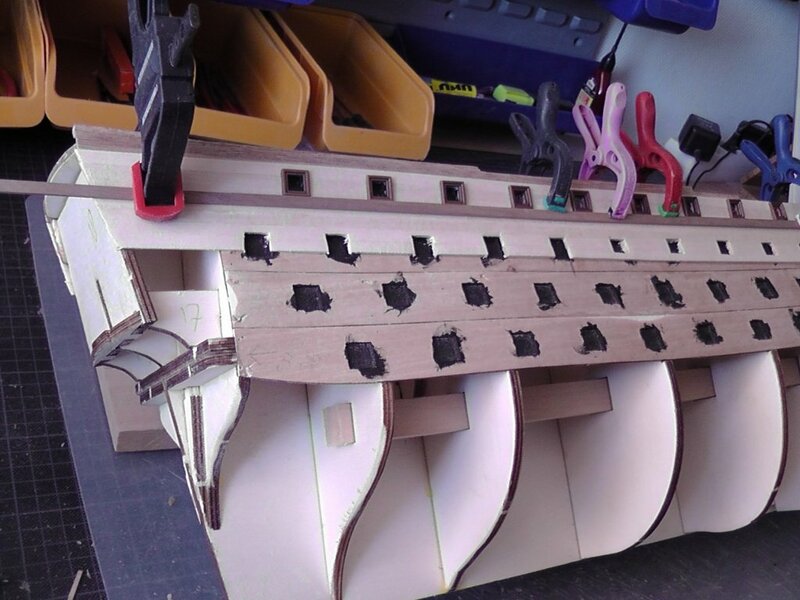 Then you will place the rubbing strakes. I will do it the different way. 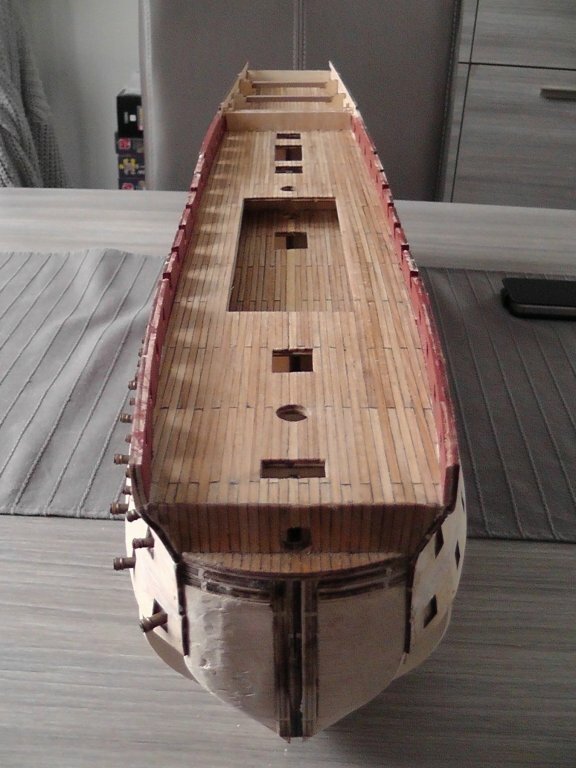 I have all ready sanding the planks and will put now the rubber strakes. 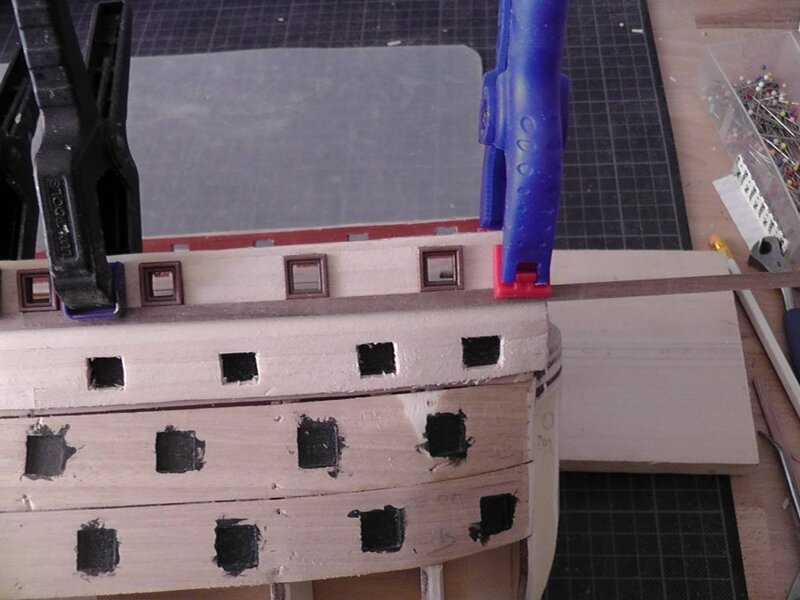 Also glue in the frames for the gun ports for the upper deck. Looking good Sjors! Coming along really nice. I love it! 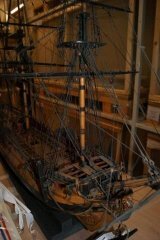 Do you plan to paint the hull? What colors? hmmmm do you mean rubbing strakes? No. I'm not painting the hull. The lower part is gonna be the wood that you see in the first picture on top and I love that. Above it is the wood you are now seeing under it. Maybe a layer of tung oil and that's it. I think nervous about the coming holiday in France in two weeks.....yippie ! I'm 'away' for a few months and I find you've started another model - the moss most certainly does not grow on you Sjors! (if the expression translates!) Looks like you're off to a great start despite the keel setback, should be beautiful when completed. How does she compare sizewise to the Aggy? 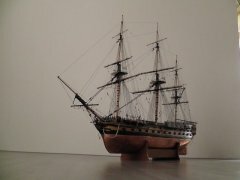 - bigger ship but a smaller scale? I did not see the popcorn machine on the way in, is it gone already? I hope your trip to the South of France was wonderful! I don't want to wait that long to start with another. This one i wanted to build for a long time. And why waiting when i can started right now? It goes slowly from now on because of work. Long story but now i go back to work so less free time. The ST is not that big as the Aggy but different to build so an other challenge. Don't know how I missed the start of this build but I've found some room in the back and a little popcorn leftover so I'm ready to join in! 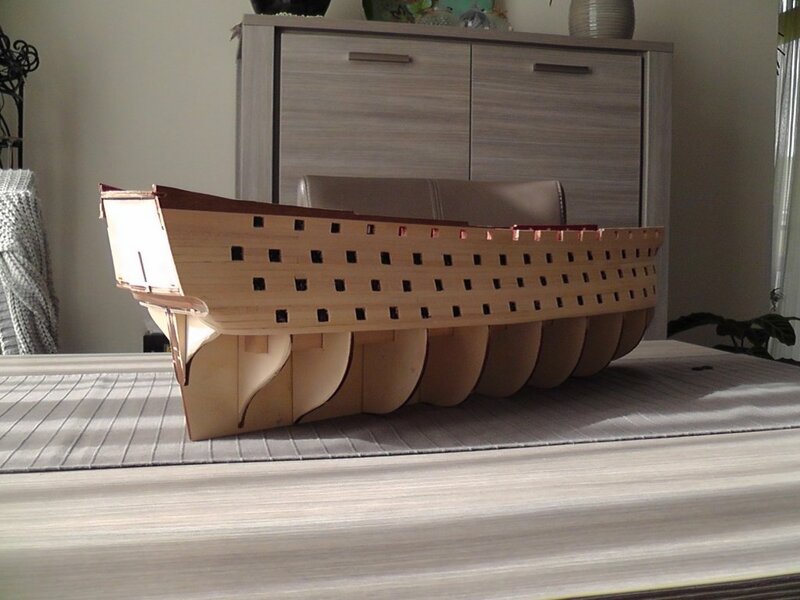 Looks like you are off to a fine start on what should be a fun build. It's great seeing you back, Sjors and also to hear you have a great trip to France. The build goes very slow at the moment because of other things. When i can find the time and have an update ,you will see it. And here we go again ! I was not satisfied with the whole build. 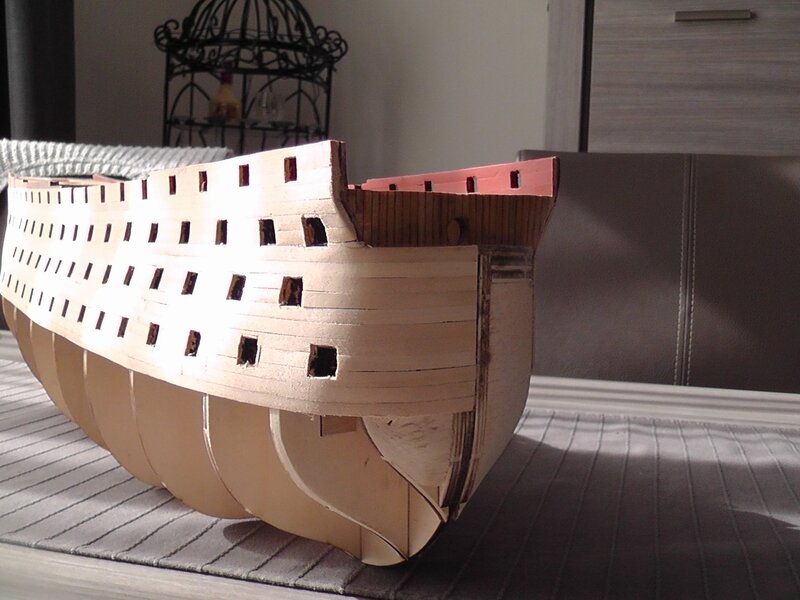 I was to lazy to put balsa blocks into the bow section and that was a bad idea! The planking was not going as it should be so.....start all over again . Not only the planking giving me problems also the decks. The deck was coming in 4 pieces and they want me to plank when it was not at the ship. The result you can see in early pictures. I have change it and planked when the deck was on the ship! And now you are thinking that I remove everything but no. OCcre give us the opportunity to buy packs. For the ST it will be 6 packs to finish the build. 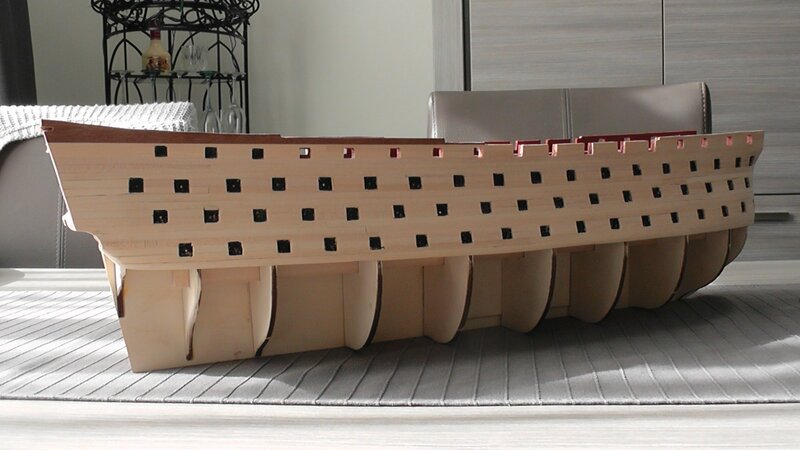 I just ordered pack one with the false keel, decks and deck planking and the bulwarks. And the pictures are showing you where I am at the moment. 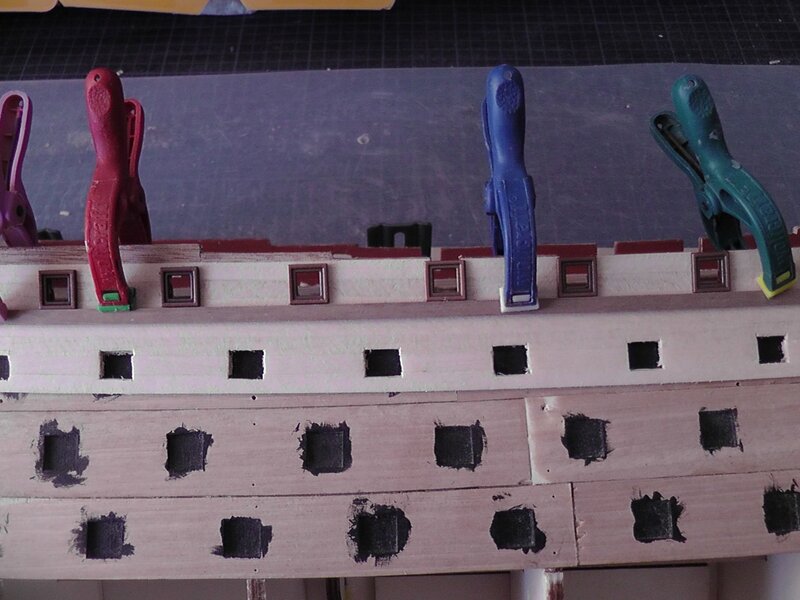 And yes, there are balsa blocks in the bow this time. I hope that the planking is going smoothly. I know that the bulwark's are much better now ! A very nice recovery, Sjors. If you find any extra mojo, send it my way. Seems that my "get up and go" has "got up and went". Excellent recovery! You should be able to keep moving forward now with hopefully no more steps backwards. A big welcome back Sjors. It is always a pleasure to see you builds. The feeling of redoing something and getting a better results is great, ain't it?? I know where it is.....take a look in the garage!!! I know there will be re- do' s all the time. when i'm not happy ill will change it! 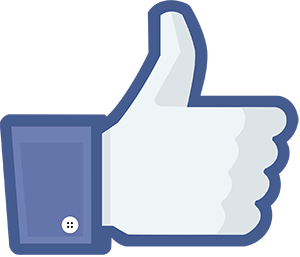 And yes, it gives a good feeling to see that it is better then it was. 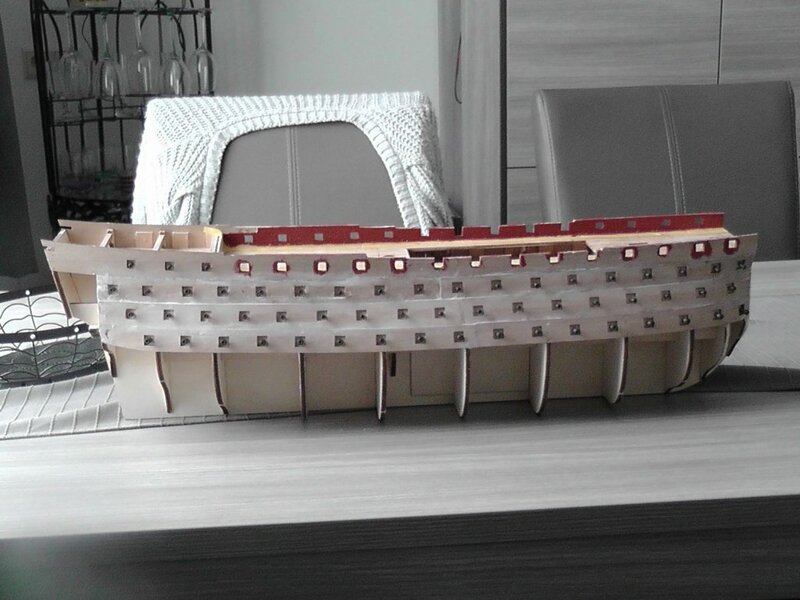 The top planking ( ramin ) on the starboard side is done. Under that there will be sapelli wood. And nope, not a second planking . Just single in two colors. 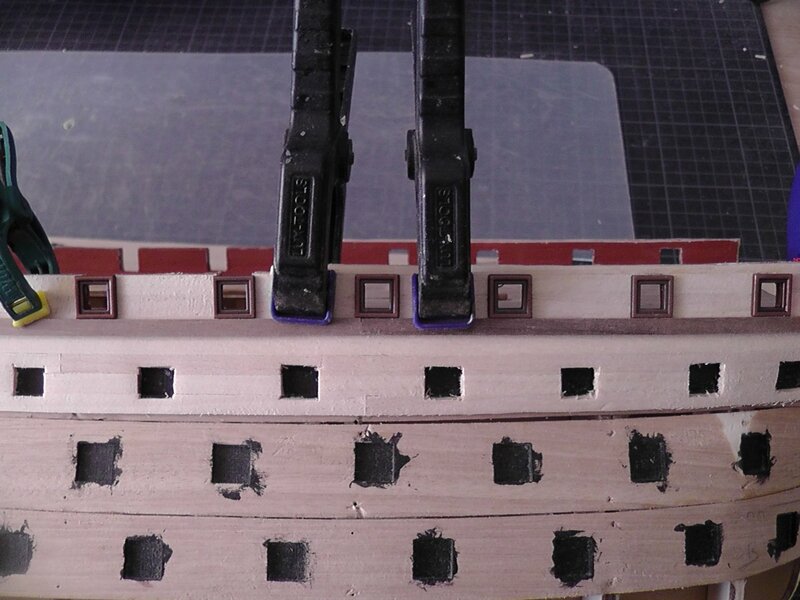 The frames for the gun ports looks if I was drunk when I cutting them. 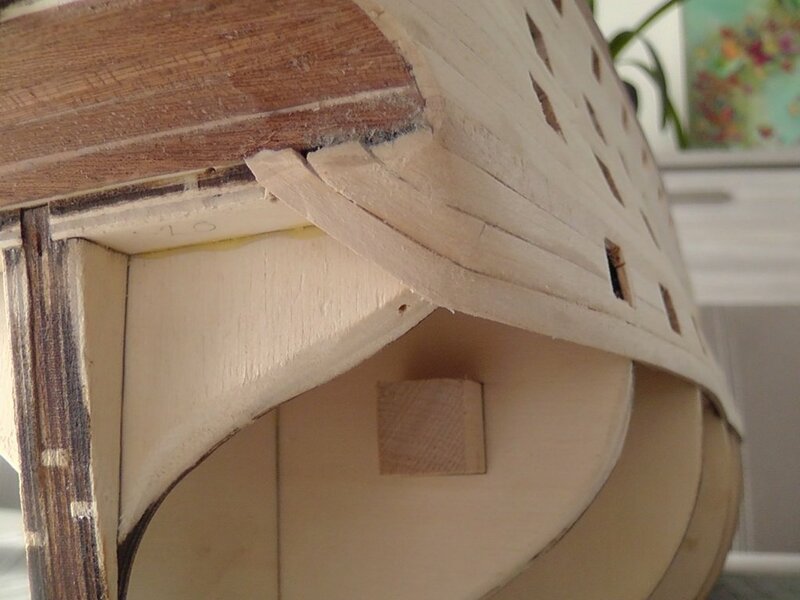 Bending the planks for the bow was not that difficult but I can not say that for the stern. The plank has to be twisted ! 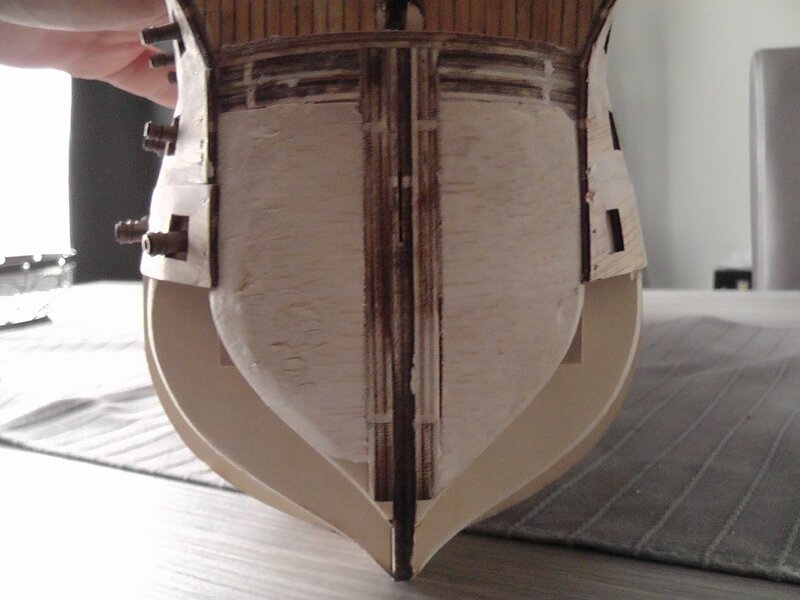 When everything is on it I will see what I will do with the planks on the stern to get a straight line. There also are little slits between the planks. I can cover a few with the rubbing strakes but not all. Filler is out of the question because you will see that when I put Tung oil on it. Welcome back Sjors, glad you found your Mojo, that little guy can be hard to reel back in when he takes a vacation. Planking looks good but I have a question. 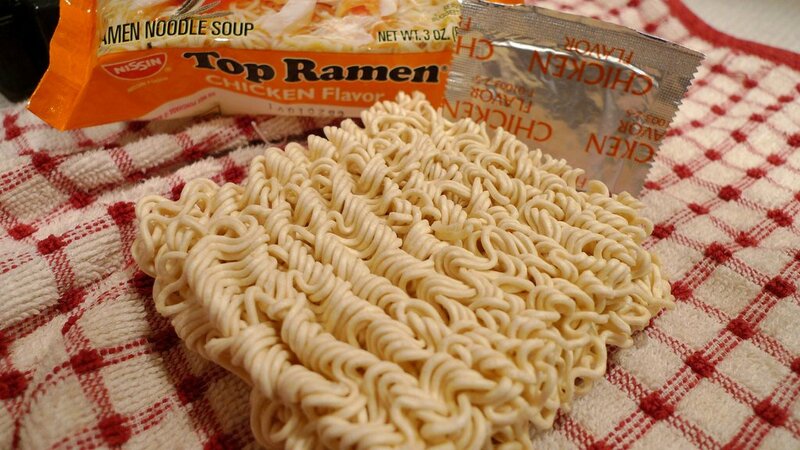 Here in the States we have something called Top Ramen, a noodley food like product. Why would you use that for your planking and how on earth did you get the noodles straight enough to plank with??? I will tell you a secret but please keep it in front of you. And don't tell Anja ! really nice start on the planking Sjors! So that's the trick.......soak it first ! those might.......I like the shrimp flavor better great synopsis Sam....a food-like product! Those gunports will definitely keep you busy! She's looking great. 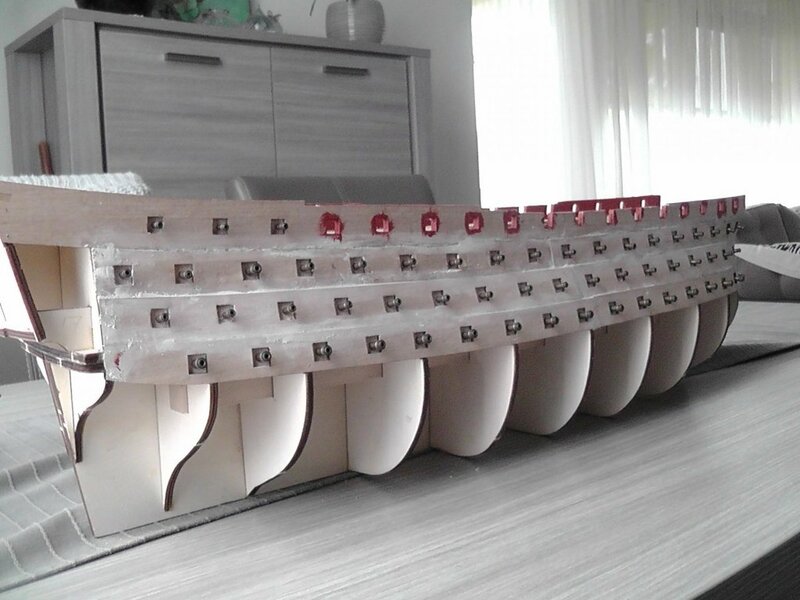 Great job Sjors, she looks beautifull. 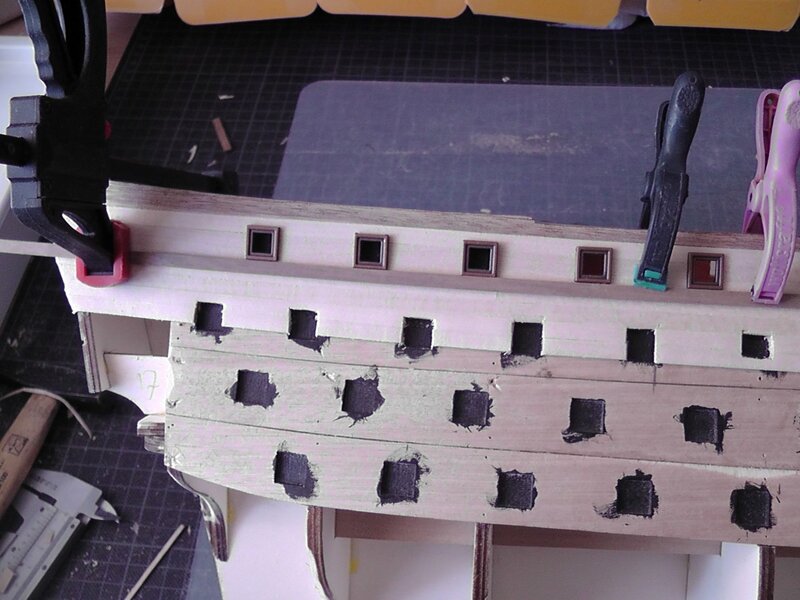 The gun ports are the easy things.